Today a meeting was convened of the Maxi cab owners, Tum tum, Tata magic /ace owners in Traffic police south police station. RTO Mr.Hemadri was also present. 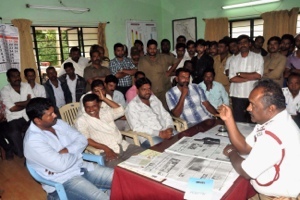 Meeting was inconclusive on any matter and another meeting with auto drivers is fixed on Friday. The auto drivers first point is stop this illegal movement of maxi cabs within the city. This meeting was called to decide fixed point. Maxi cabs/ Tumtums coming from Kakti side will halt at BIMS. Again these are just suggestions and nothing concrete is mentioned. How ever Traffic CPI said one day we will have to implement this so why not now. A staggering figure of 6300 autos was mentioned by the Traffic CPI and another 3000 must be illegal was also mentioned. Currently 4 personnel are there for meter repairs another 4 will come from Hubli and another 2 tomorrow from Bangalore. With all these be sure Belgaum mein auto ka meter Jaldi Down nahi hoga….